It seems already in EOS short lifespan, a fork has come about. Of importance, is that it is by known and experienced block producers, expressing dissatisfaction with the state of the network and proposing to build an entirely new blockchain to address the issues. 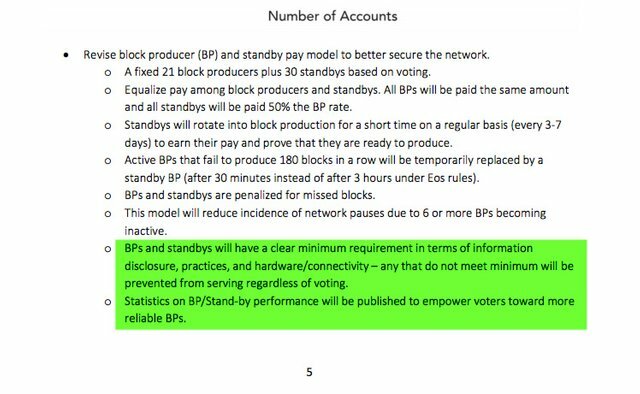 One such claim is a ‘whale controlled’ monopoly over block producer (BP) nodes, by using an already large stake to vote in their own lesser BPs. As a consequence, gaining even more control over the network (over-centralization). Everyone is talking about Telos. 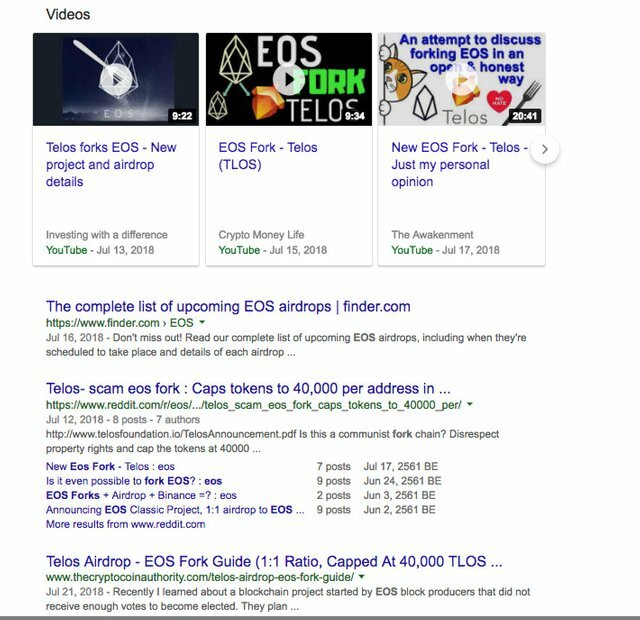 Below, Aug 23, 2018 – just take a look at the result from a Google search of “EOS FORK” and it’s all Telos. 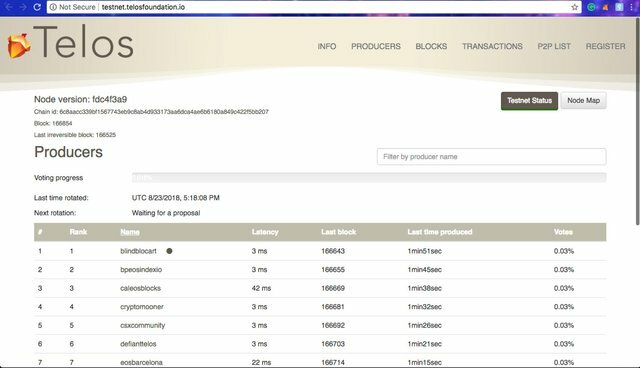 Blockchain Project Review Number 3? Putting this together, we found it would be easiest to follow are recently introduced review format. In doing so, it gave up almost everything we needed to know about Telos. 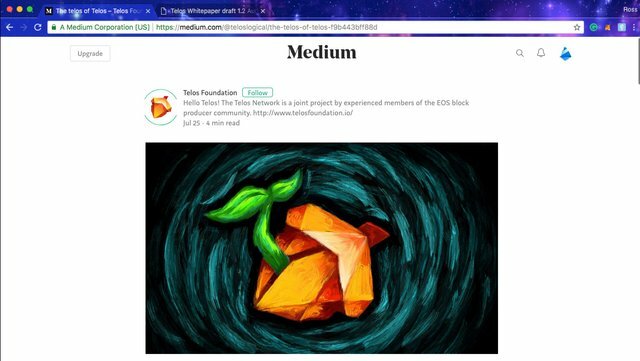 We did go to extra lengths also to reach out to the Telos community and introduce ourselves. As you shall see, it is seems like a team with knowledge and integrity, with the added advantage of an existing, passionate community with tools and skills to hit the ground running. More than that, of course the world is looking – this has to be a highly motivated and serious community or it’s nothing – taking a path down a new road to what they committed perhaps 2 years ago already. With that said, in the next part we’ll hear from a project founder, then bring you all the links and screenshots we took, with commentary. We changed the original approach to spread the 6m TLOS tokens across all contributors using a version of the BitShares slicing pie approach. We have brought in two experts in compensation to review our model and schedules. EOS Detroit is building a great interface and we expect this to become the model everyone studies and uses in the future for these types of decentralized projects. I expect all tools will ultimately be available on Telos and recommended as standard for all large Telos WPS proposals. Right now there are >70 contributors who will share the 6 m tlos. Membership is open, new people join almost every single day and no one has been turned away. In all respects, it has to be a model in decentralized development. 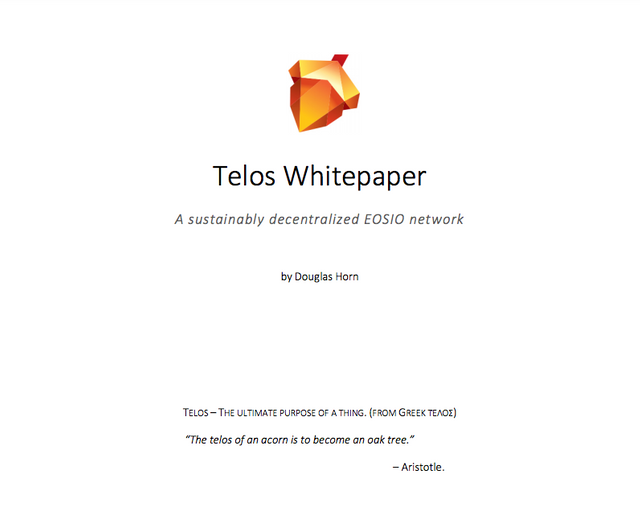 Thanks for looking at Telos for your article. 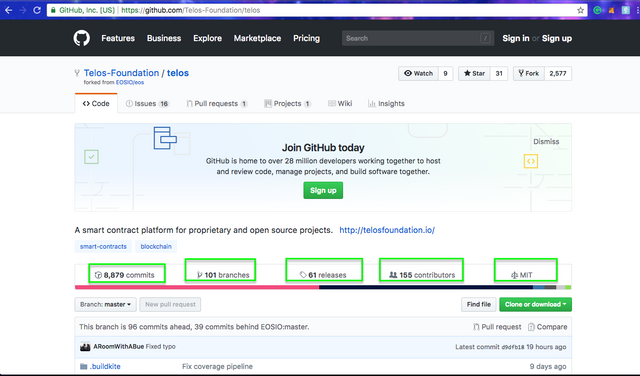 Please remember that this is a truly Community-led project with no ICO and a modest <1.8% set aside for contributors doing about 5+ man-years of work on real innovations to EOSIO – many we have already delivered! (Check our GitHub.) We believe this will make the world better. Familiar from past reviews, the tools available on gtmetrix.com and seositecheckup.com provide a rapid impression of overall technical skill, quality, thought to detail and effort in general. Finally, we will try to share some of the errors and things to be fixed. Here used just for a quick impression, however, the news is good and the website has been well put together. We will just touch on a few things for polishing to get over the ‘PASS’ level. Whilst the score above has room for improvement, it is respectable for now. Standout in simplicity is the footer design. It packs a nice punch with links to the social media and communities. Only one improvement we’d make would be not to publish the email address, as this will get spammed, and implement a secure contact form instead. 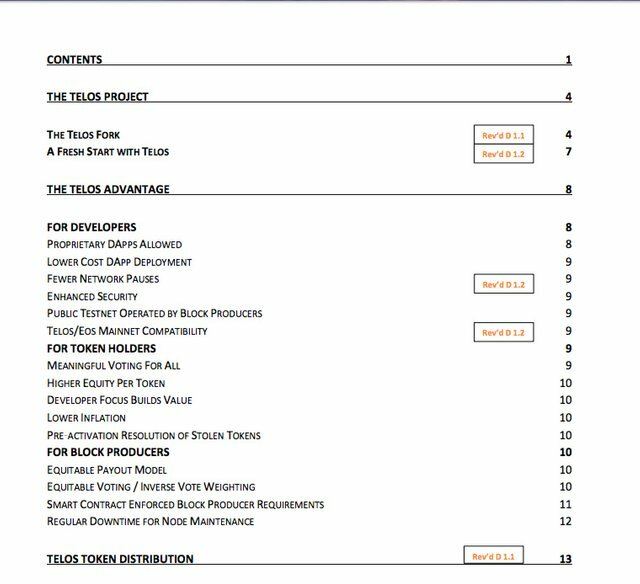 Next we delve into the whitepaper. 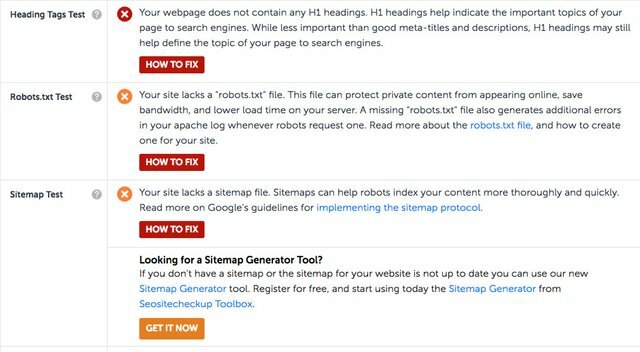 First we find it to be highly presentable, with roadmap version markers throughout. Starting with the table of contents as always, it is clear the paper wastes no time in beating around the bush, assumes the reader is partially familiar with EOS and gets to the meat of the topic and stays specific to it. Highlight from the whitepaper, we marked in green 2 particular rules we liked and feel important to platforms of this type. The main whitepaper criticism, and polishing act that could happen in a future revision – is to make more of an identity, to not be so concerned of the perceived or real EOS problems and using that as the main fuel – and just get on with building a vision. 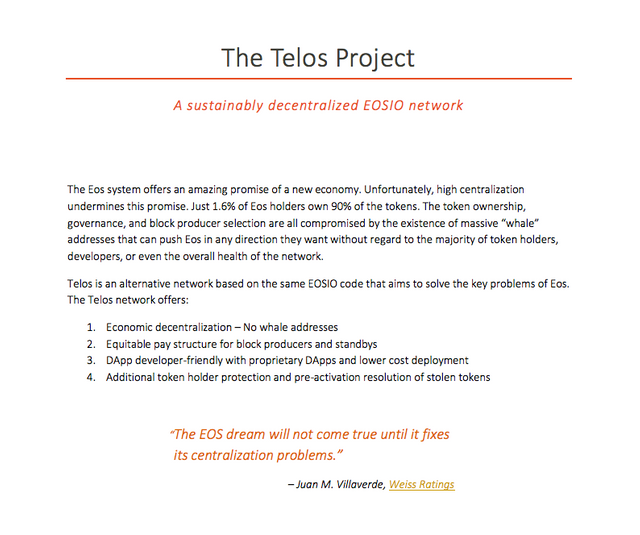 Without sounding too biased and really trying to stay objective, the author (@britcoins) feels Telos would hope to stand without the shadow of EOS over it. 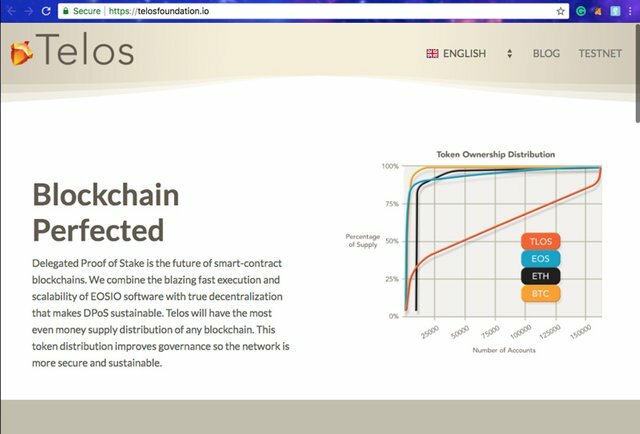 There is no denying Telos is a very interesting development in the crypto-space. We’re keen to see where this goes, and can’t see a harm in it – done properly, and by a solid and legit team. Whatever happens, it will pose some challenge to BlockOne/EOS and perhaps in that sense, they’ll also need to respond.